Here’s my philosophy: if it was made with dirt, water, and sunshine, just the way Mama Nature intended – it’s good for you! Sometimes we get so caught up in calorie counting and label reading we forget that Earth’s bounty is perfectly constructed to sustain human life. We are in a symbiotic relationship and a box, can, or tin shouldn’t necessarily get in the way. In between meals we tend to reach for that canned energy drink or packaged energy bar at convenience stores and vending machines, both of which are 99.9% of the time highly-laden with chemicals and toxins our body should never even come into contact with! Snacking is perfectly healthy and keeps our metabolism going, but we usually snack because 1) we’re spacing our meals too far apart and are hungry, 2) we are in fact thirsty and simply need to drink more water, or, more often than not, 3) we like to simply munch mindlessly on something, whilst focusing on a given task. So why use snack time to fill our bodies with detrimental toxins and caffeine crashes that leave us feeling burnt out? Why not use it to build a healthier body – one that can rebuild itself more efficiently, function at top speed and vitality, and keep us energized throughout the day? Homemade almond butter. 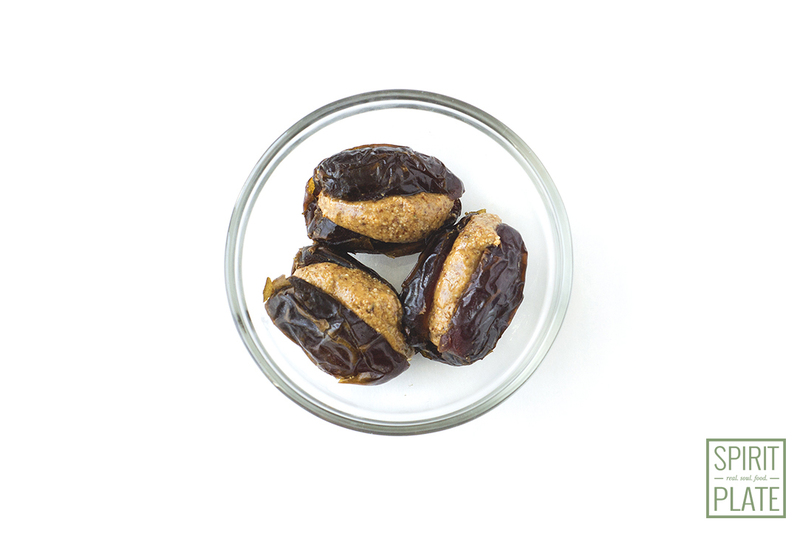 Pitted Medjool Dates. Sweet and salty, the perfect mixture of carb, protein, and fat. These guys are like candy, so ooey gooey and decadent! It’s hard to resist; I can usually have an ungodly amount in one sitting! I also love that they don’t need to be refrigerated, just pack a few in a small bag or container and you’re set! For almond butter: toss almonds in a food processor or high-speed blender with a pinch of sea salt. 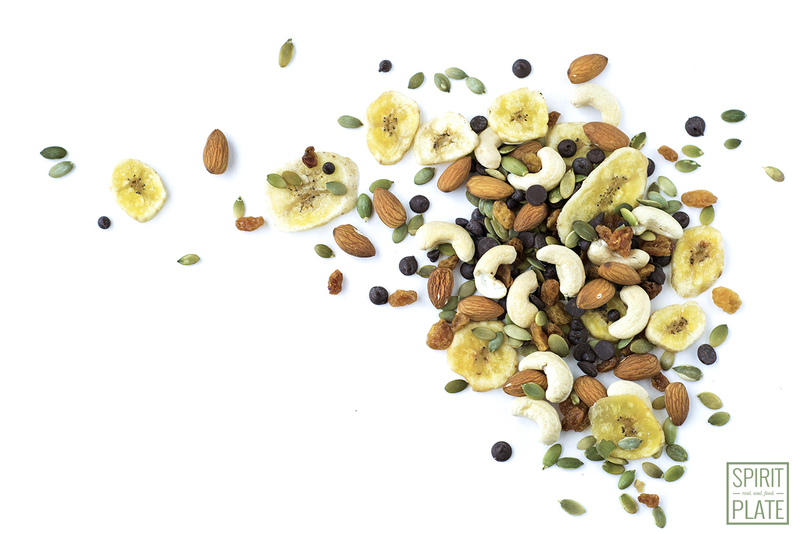 Blend away until it goes from crumbled to powdery, the oils are released and the almonds start to clump back together. Add agave or honey for sweetness. Scrape down the sides with a spatula, and keep blending until a desired consistency is reached. Store in an airtight jar in the fridge. Perhaps the most popular snack at fast food restaurants, cafes, and gas stations: it’s so simple! 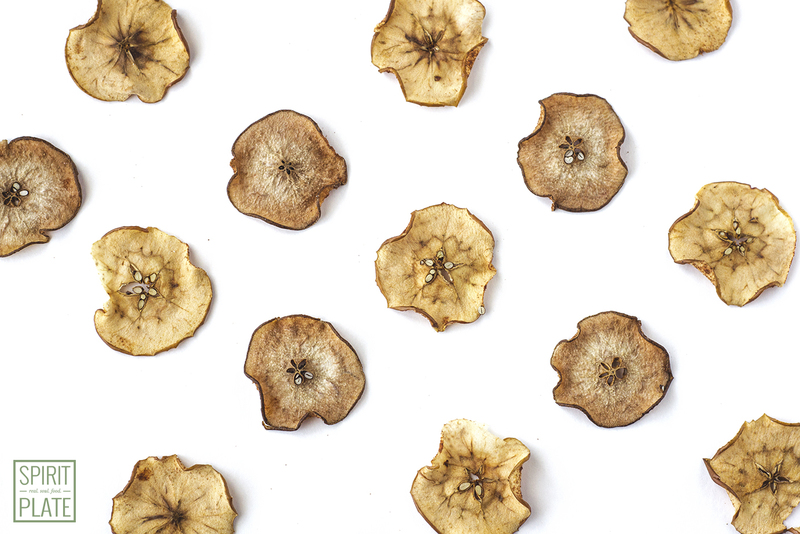 Just slice up apples, pears, carrots, celery – any firm, starchy fruit or veggie, and bag them. Ditch fatty and chemical laden ranch dressing or sugar-filled flavored yogurt for a healthy alternative: nut butter, tahini (essentially sesame seed butter, now widely available at any grocery store), hummus, or guacamole. My favorite is tahini mixed with agave and lime juice. Don’t have a sweet tooth? 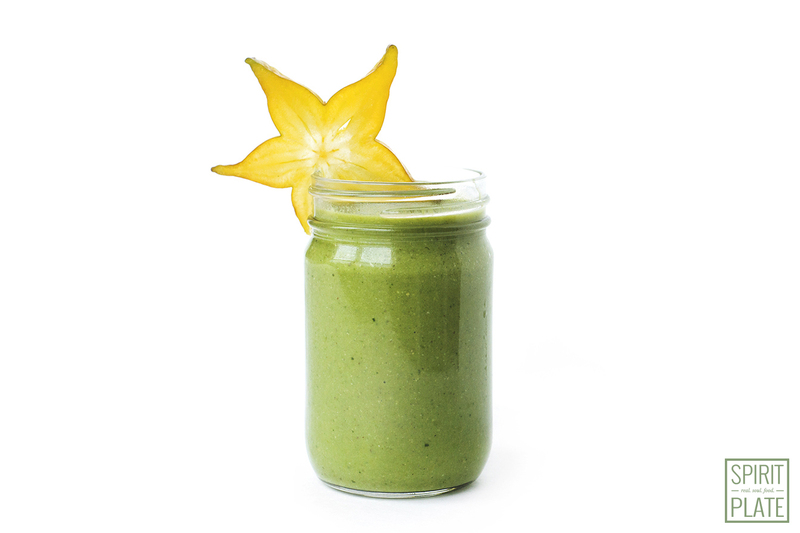 Try Aly’s favorite: slice up a tart raw green mango and dip into a cayenne-salt mixture. If you’re not an avid water drinker like me, try an agua fresca. 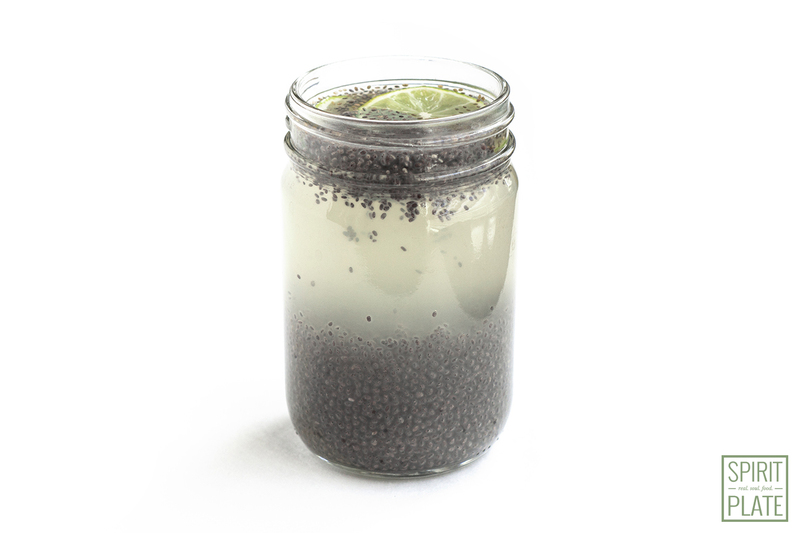 It’s essentially chia water – regular water, coconut water, or home squeezed juice with chia seeds. Be sure to soak your chia seeds first – about a 1/4 cup of filtered water to 1 Tbsp chia seeds. Then add your base liquid. Try lemon, cucumbers, mint, or basil to flavor it. A friend of mine uses rose water! If you’re trying to kick your soda addiction, use a SodaStream to carbonate it or add a carbonated water beverage like La Croix to the mix. Make ahead, bottle, and refrigerate for a grab-and-go beverage! I don’t think I need to harp on about how amazing Powerballs are. I can go for hours on just two Powerballs. 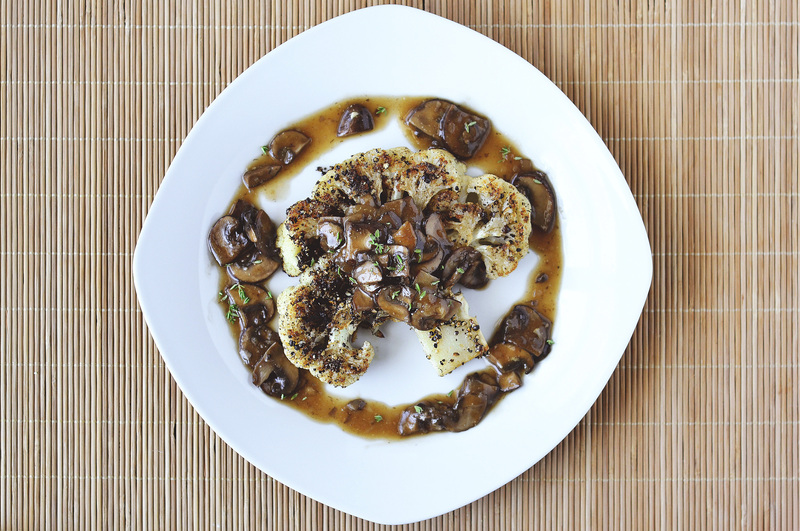 Try our recipe here. Kale, Sweet Potato, Brussel Sprouts, Pear, or Apple Chips – Add some cayenne or cinnamon, and pop them in the dehydrator or oven on the lowest setting – between 190°F and 220°F for two-three hours flipping them over once half way through. 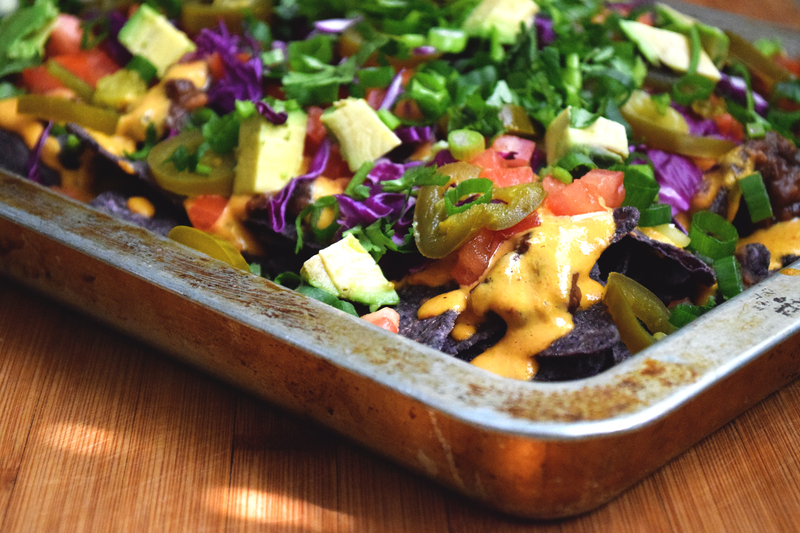 Turn the oven off and let the chips sit in the oven as it cools – approximately another hour. Store in an airtight container to maintain their crispness. A liquid, a green, and a fruit. That’s all you need. Add a spoonful of chia, flax, or hemp seeds for extra protein. Here’s one of my favorites: 1 cup nut milk, 1 banana, 1 scoop protein powder, two heaping handfuls of spinach or kale, 1/4 beet (red or golden), and two large handfuls frozen berries. (If you’re using fresh berries, just add a few cubes of ice on top.) Add to blender in order listed and blend away until smooth! Fill up your to-go cup or mason jar for a speedy breakfast or pre-lunch snack. It doesn’t get more fast food than this. Toss a couple bananas in your bag and head out the door. Bananas also function really well as a mono-meal – have 4-6 for a filling meal or 2-3 for a mid-day snack to hold you over. Not a banana fan? Any fruit with thicker skin will do! Substitute cacao nibs or carob for chocolate chips, add coconut shavings, pumpkin and sunflower seeds, nuts, dried fruit, etc. for a truly powerful mix. I love to add this to my granola or oats with hemp milk in the morning for an energizing breakfast. Super simple! 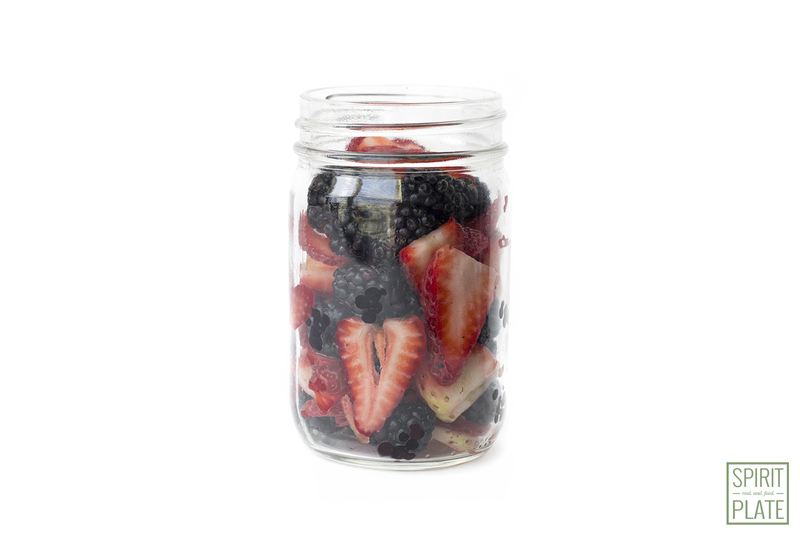 Just layer a mason jar with fresh organic blueberries, strawberries, raspberries, and blackberries. Make sure they’re washed and patted dry to prevent sogginess. Throw the jar in your bag to enjoy anytime throughout the day. These are just my favorites. 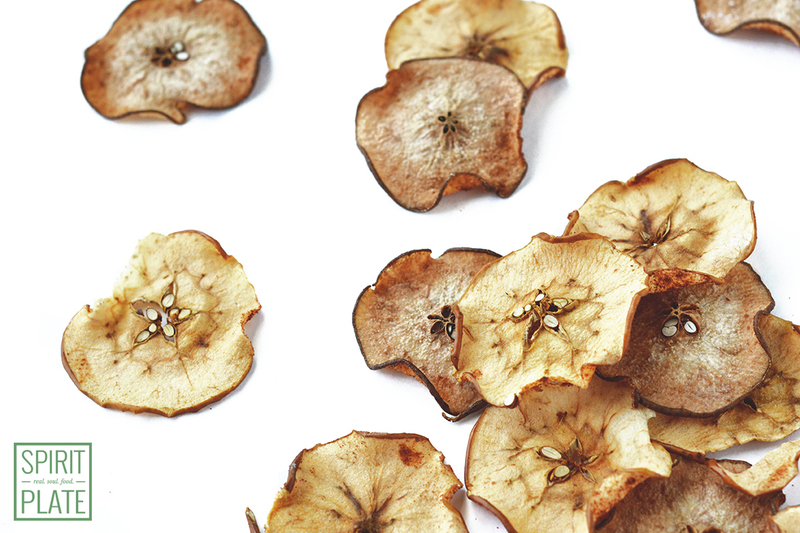 There are plenty of other clean, wholesome foods you can snack on throughout the day. I’d love to hear from you! What are your favorite go-to snacks? Comment below! I’m trying to get off wheat and sugar, so I’ve been lkoniog for a starter recipe using almond flour, this one turned out pretty well, despite a lot of substitutions I used half chickpea flour, I added cocoa instead of chocolate chips, subbed earth balance for the fat and sweetened with a little coconut sugar and stevia. 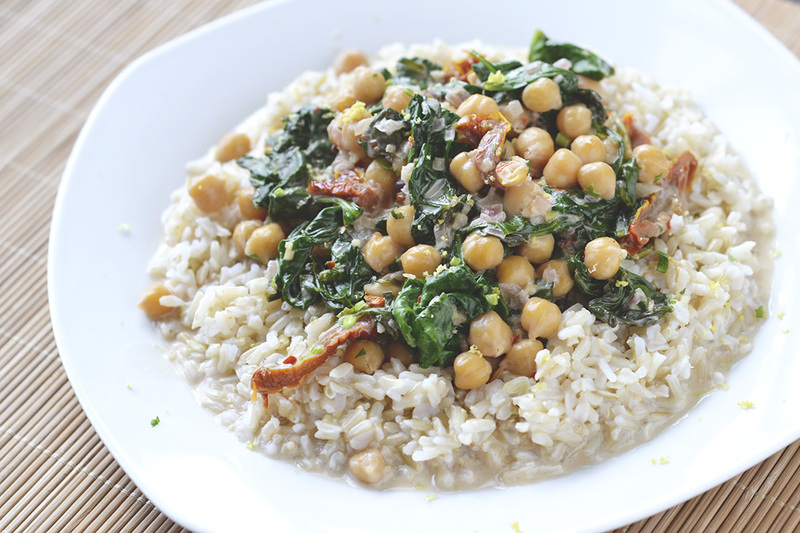 Still pretty delicious, so thanks great recipe, really simple and flexible!